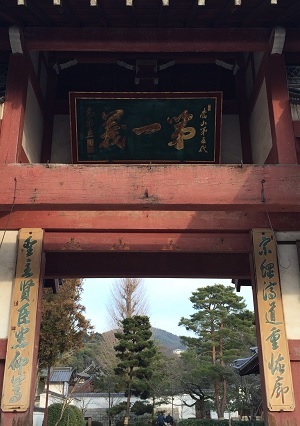 When one goes to Obaku temple in Kyoto he sees carved over the gate the words "The First Principle". The letters are unusually large, and those who appreciate calligraphy always admire them as being a mastepiece. They were drawn by Kosen two hundred years ago. When the master drew them he did so on paper, from which the workmen made the large carving in wood. As Kosen sketched the letters a bold pupil was with him who had made several gallons of ink for the calligraphy and who never failed to criticise his master's work.